It was good to be back in the pews at Singapore’s Cathedral of the Good Shepherd on Sunday after a four-month absence. In the UK I had access to the most spectacular buildings, the most superb choirs and some of the most uplifting and inspiring music, but there is still something warm and homely about the Good Shepherd, and Peter Low’s marvellous choir is always a joy to hear, irrespective of the music they sing. Sunday morning’s Mass included some lovely items; most notably the Sanctus and Benedictus from Schubert’s Deutsche Messe – an object lesson in sublime musical simplicity – as well as a couple of gorgeous hymns, Repton (although an inserted verse had me in fits with the strange phrase “Temptous Seas” – suggesting that Peter had stepped out of the boat allured by the tempting water rather than appalled by its tempestuousness) and Jerusalem, used somewhat incongruously as a setting for words about “a new song” but which proved to be a gloriously invigorating start to the service. I do miss a concluding organ voluntary which would send the congregation out on a high, especially as the Good Shepherd boasts a very fine organ, but I suppose there are good reasons for this which a simple musician cannot be expected to appreciate. The absence of an organ voluntary does, however, allow an immediate upsurge in conversation among the congregation as they head towards the doors, and I got caught up in one of these as I left on Sunday. I was reminded that on a previous occasion I had suggested that some of the music sung at Mass was “vulgar”, and I was asked what I meant by the word. That caught me up short. How often we use a word to hang a whole range of ideas on without really thinking about the word itself. I know what I mean by “vulgar music”; but does anyone else? “Vulgar music” implies for me Street Music, or the kind of innocuous musical sounds which impinge on our daily lives without any requirement for us to exercise our brains to process what we hear; not so much easy listening, as brainless absorption of unexceptional musical noises. But others have a very different perception of the word “vulgar” as applied to music. There are clear dictionary definitions of “vulgar”, many of which veer towards the concept of “rude”, “indecent” and “sordid”, but I see it, when applied to music, more along the lines of “tawdry”, “unrefined” and “kitsch”. In short, the word’s definition spreads so widely that to use it loosely is a pretty pointless exercise, and I apologise for having done so. But how, then, should I explain why some of the music I hear in church is, to my way of thinking, wholly objectionable when it is deliberately designed to be harmless and innocuous? 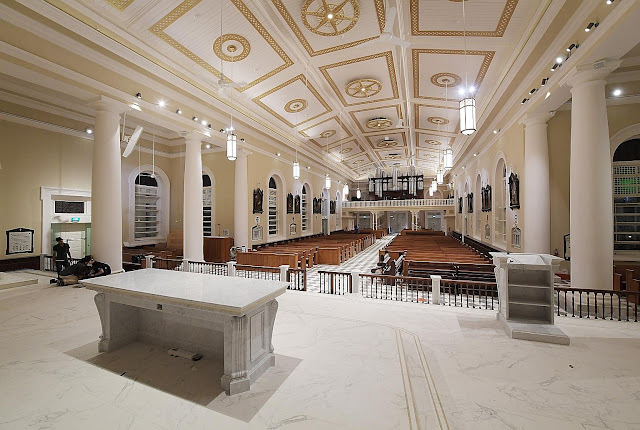 The Roman Catholic Church, more than any other Christian denomination, can look to centuries of musical tradition which have yielded up some of the very greatest and most inspiring artistic creations man has ever produced. In the service of the church, composers have drawn from the deepest wells of their skill, creating magnificent music intended expressly for the glory of God and the inspiration of those who hear it. Their driving force was always a desire to produce the best in praise of their Creator. The modern-day idea that serving God through music simply involves taking what is popular in the streets, bars, clubs and brothels of every day existence, was anathema. That all changed in the immediate aftermath of Vatican II in the early 1960s. Coinciding with a general loosening of public morals and the explosion of Pop culture (not for nothing is the decade still referred to as the “Swinging Sixties”), the church’s decision to dispense with some of its hallowed traditions – notably the abandonment of the ancient language of the church, Latin, and the shattering of the mysteries of the Mass by turning the priests round so that they showed the congregation what they were doing rather than keeping it hidden from sight – seemed to open the door for a complete relaxation of standards across the board. That, as Pope John XXIII put it, the church needed to let in some fresh air, was obvious; but as is so often the case, give an inch and people take a mile, and the repercussions of Vatican II led to an almost total abandonment of the high artistic standards which up to that point had permeated all church music. One of the joys at the Good Shepherd is that they happily use Latin and invoke the musical traditions of the church by frequent use of plainchant, which is easily woven into the fabric of the service greatly assisted by the consummate skill of the choir in performing it. But alongside this, they often regurgitate nasty, tasteless and wholly inappropriate street music presumably in the misguided belief that “it’s what the people like and experience in their daily lives, so let’s bring it into church”. That is an attitude which destroys the whole fabric of church music, the purpose of which should be to uplift, reflect and inspire on the great principles of faith – not to serve as a sordid accompaniment to bland utterances of simplistic notions of peace, happiness and joy. An act of religious worship should take people beyond the drudgery of their daily lives and into a spiritual place way beyond their normal existence. The function of music is to make that journey easier, not to keep us firmly rooted to our daily existence. Peace and Harmony - What is it?